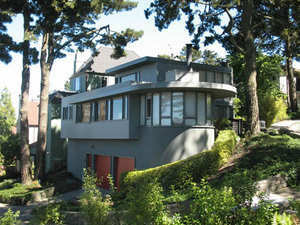 SAN FRANCISCO, CA--(Marketwire - September 17, 2010) - In 1954, Alfred and Mabel Salter (parents of Lucile Packard) commissioned to design a home for their family in what is now Forest Hill. Salter was a self-employed photo engraver, and Mabel kept his books for him while working as an attorney's secretary and dabbling, rather successfully, in investments. The design is attributed to Henry Hill, who was then an up-and-coming architect, making a name for himself with his unique style of architecture combining European modernism and the rustic landscape of Northern California to create what is now known as the Second Bay Tradition. His award-winning style was described by the San Francisco Chronicle as "flamboyant modernism." The property at 29 Mendosa Avenue is the product of Salter's dream and Hill's vision, and it is clearly evident that the home is a rare gem. Surrounded by a pine and cedar forest, it affords stunning views of the Marin headlands, the Golden Gate Bridge and the Bay. This home was clearly designed for entertaining. The gourmet kitchen, the serene courtyard, the polished oak floors, and the floor-to-ceiling windows all lend themselves to almost any style of celebration, formal or casual, or simply to contemplate the delightful surroundings. The kitchen houses all new high-end appliances including a six-burner range, two dishwashers, Sub-Zero refrigerator, custom range hood, cherry cabinetry with plenty of storage and a beautiful granite countertop. The spacious open floor plan features a wood-burning fireplace. Two bedrooms and a full bath complete the tour of this floor. Upstairs the master suite features views and access to the rooftop deck. Below, there is two-car, side-by-side parking, a washer and dryer, storage and a bonus room. "Architecturally speaking, this home has a bit of history and intrigue and comes with three sets of plans," said Mike Ackerman, listing agent with Zephyr Real Estate. "This sylvan one-of-a-kind home is a San Francisco treasure and a 'must see,'" he added. Previously approved plans for a 750 square-foot expansion designed by celebrated architect, Bruce Tomb, provide a bedroom and additional rooms on the second floor. Forest Hill is a serene wooded neighborhood with a feeling of remoteness, yet is conveniently near West Portal with its variety of shopping and dining establishments. The Forest Hill Clubhouse is a frequent gathering place for the neighborhood association, an annual chamber music festival, and many community events. For further information on the sale of this remarkable property, please contact listing agent Mike Ackerman at mackerman@zephyrsf.com or visit www.MendosaHouse.com. Founded in 1978, Zephyr Real Estate is San Francisco's largest independent real estate firm with approximately $1 billion in annual gross sales in 2009 and a current roster of more than 200 full-time agents. Zephyr has six offices strategically located in San Francisco and serves a large customer base throughout the City. For information, visit www.zephyrsf.com.